Soft cover coil binding is most often chosen for its ability to fold completely over on itself or lay totally flat for ease of use. It’s business-like quality makes it perfect for reports, presentations, manuals, inventory and product catalogs. It also makes a wonderful cookbook! For those doing your own layout & design, choose the template format that is appropriate to the graphics software you are using. It is important that your files adhere to the exact specifications as provided by these downloadable templates. Our knowledgeable staff is eager to help with any layout questions you may have. We provide a free file check to confirm accuracy before printing. An easy way to send us larger files or multiple files. Great for a few small files up to 10mb. Bring in your file(s) and we can review your design in person. Let our professional design staff create a one-of-a-kind book for you. Books can vary greatly in complexity, so an accurate quote is only possible after we see your project first-hand, but on average we can generally design books for about $12 to $15 per page. We work closely with each client to make certain that the final product is exactly to your specifications. We provide you with an on-screen approval of the finished design and then we print a completed book for your inspection before running any quantities. 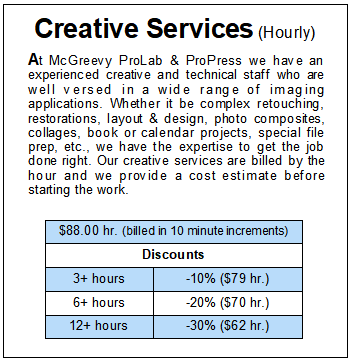 Layout and design is charged at $88 per hour. Our free online book design software will make you look like a pro. It’s fun and easy with loads of options that allow you to take creative control. To get started go to our OnlinePhotoCenter. You guys do a wonderful job! Closed between Christmas and New Years.